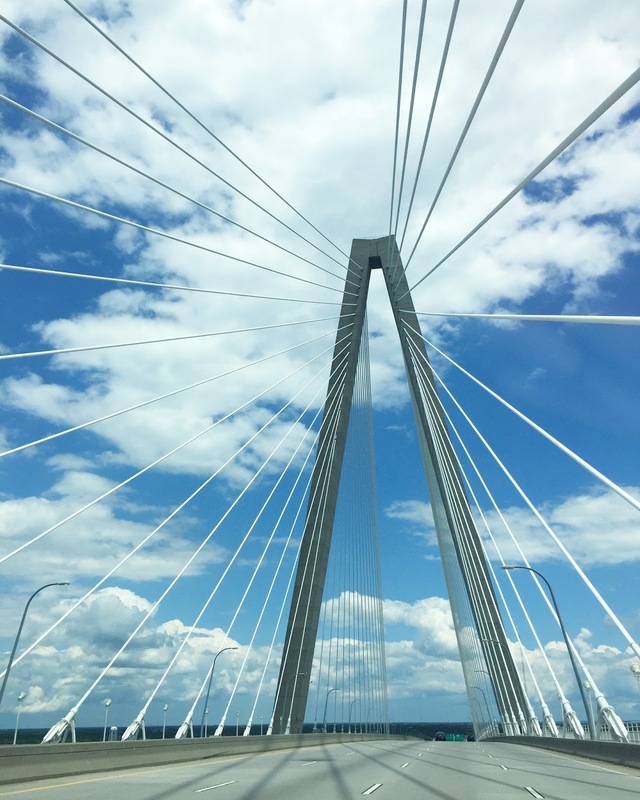 We have finally arrived home after our 4 weeks of traveling throughout the southeast, and this is my final travel diary of our time on the road. 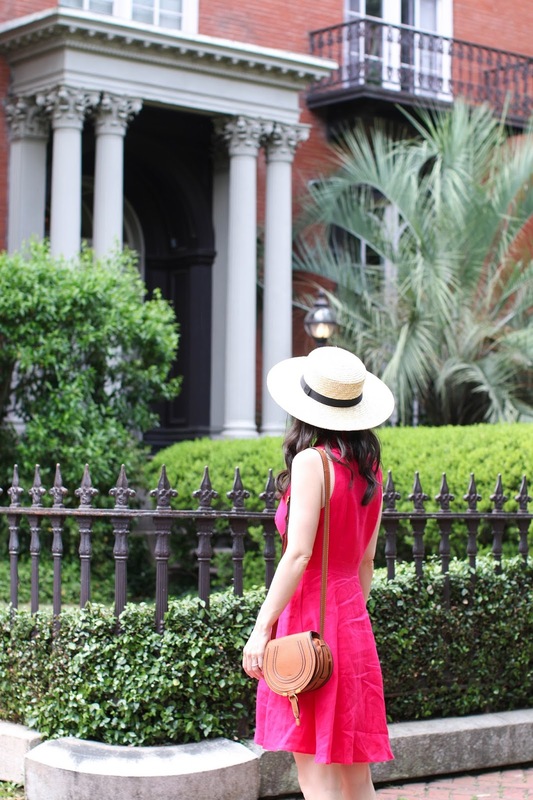 Charleston and Savannah are only 1.5 hours apart, but while they are quite similar in southern charm, there is still a bit of difference between the two. 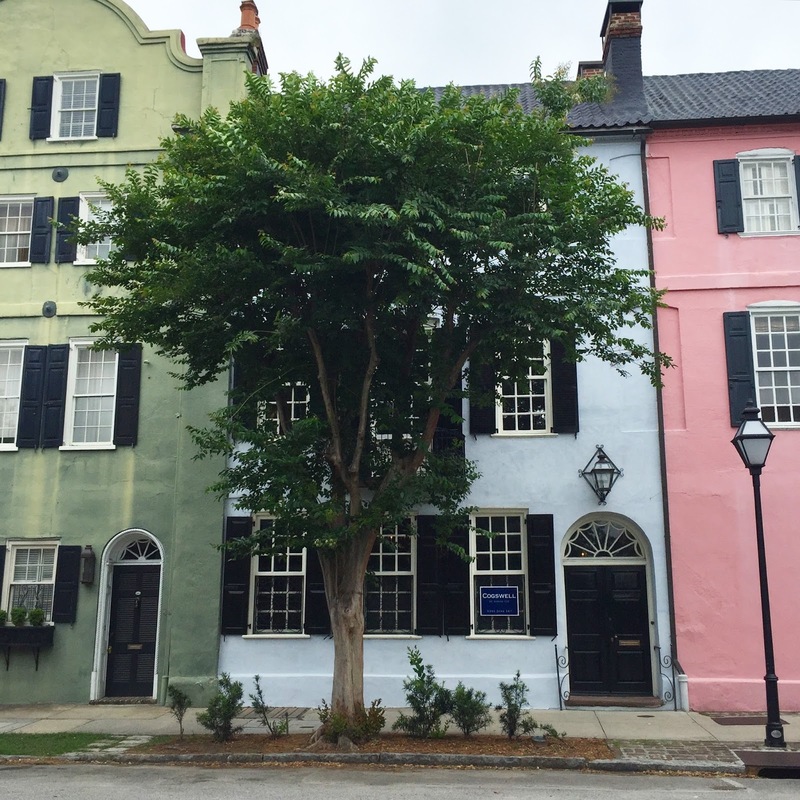 Charleston is much more metropolitan with a larger food scene, shopping, etc, while Savannah feels much more quaint and historic. Both have amazing southern charm and are worth visiting on the same trip because they are so close. 1. Rainbow Row - This was the first neighborhood we visited when we arrived, though be warned it is a huge tourist area. We went on a Thursday morning and there were already tons of people walking around, and it stayed busy non-stop. However, the homes are stunning, grand and vibrantly colorful, and it's great to park nearby and then wander throughout all the streets. There are many neighborhoods we drove through that were picturesque, but this one is definitely worth a visit and be prepared to take tons of pictures. 2. 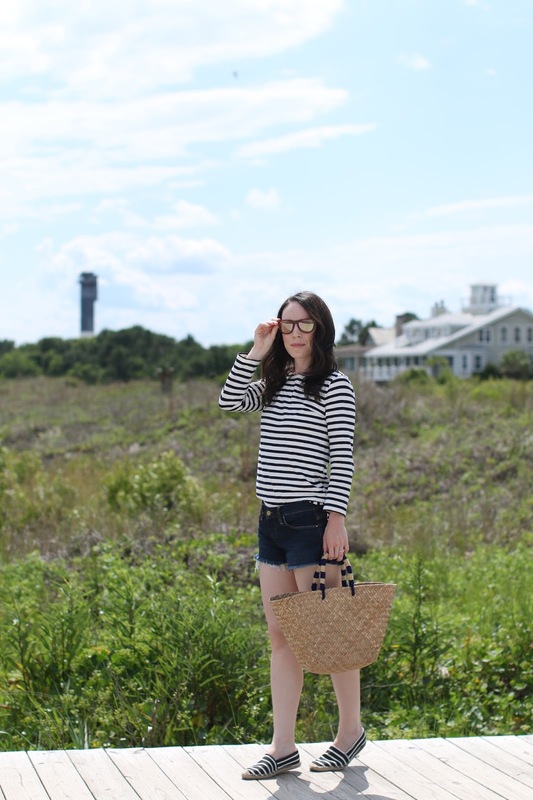 Sullivan's Island - We visited both Foley Beach and Sullivan's Island, though we liked Sullivan's Island a bit more. The homes were beautiful, the beach was pristine and there were tons of great restaurants to choose from right on the main street. We ate lunch at Poe's and then strolled over to the beach. We didn't bring our swimsuits, so we stayed on the streets and wood walkways leading to the beach, but wandered around a bit. If you plan to visit in the summer just be prepared for the crowds. We were there in mid May and it was already packed, so I can only imagine when the summer season hits how crowded it will be. But then again, what great beach isn't, right?! 3. Shopping on King Street - King Street is one of the main streets in Charleston where all the nightlife, shopping and restaurants are located. While we wandered throughout a ton of different stores, my favorite by far was Candlefish. They carry their own candles and have over 100 different scents in their library. It was amazing. Even Stan got in on the excitement and picked out two that he loved. 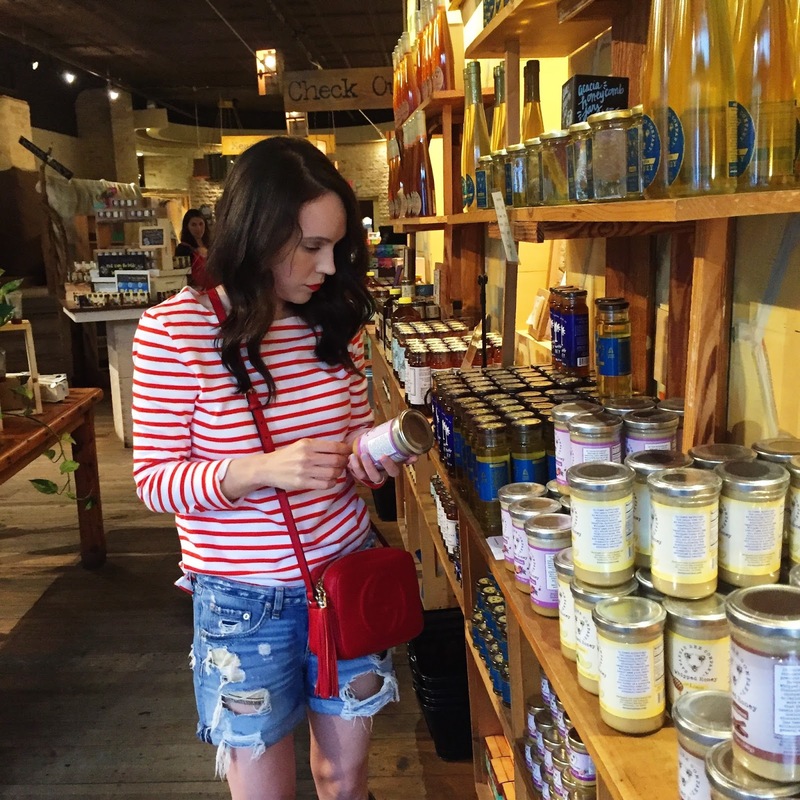 It was hard not to go crazy in this store if you are a candle lover. 1. 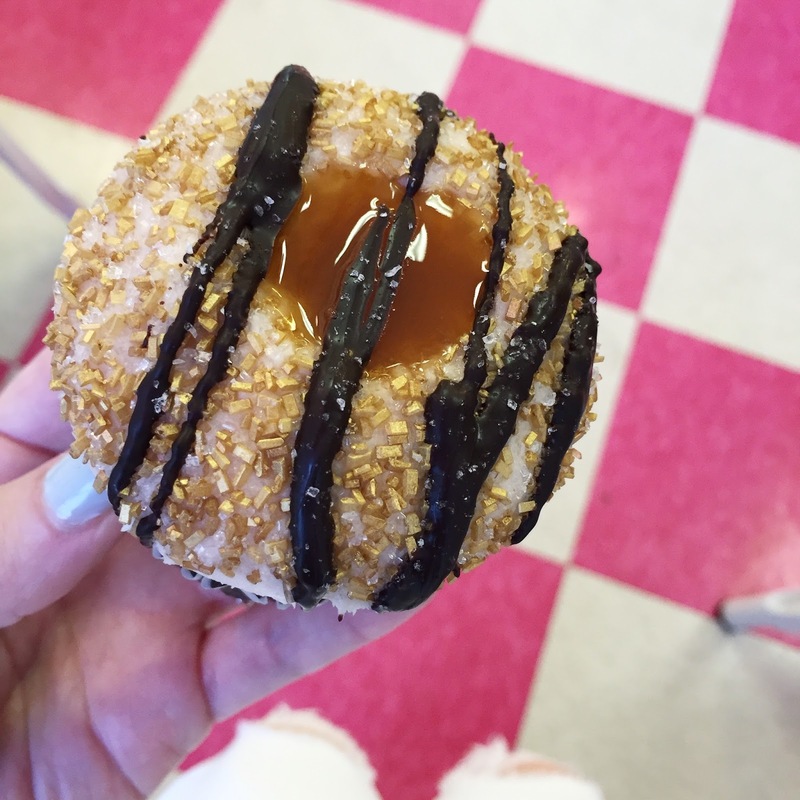 Cupcake DownSouth - Next to Nashville, Charleston had the best food of the entire trip. This cupcake place was by far one of the top 3 best cupcakes I have ever eaten. Perfect icing to cake ratio and blissfully delicious. 2. EVO Pizza - I know, a pizza joint? Come on, Maree. But hear me out - we heard from our host that this restaurant made some of the best pizza he had ever eaten and we were immediately intrigued. Fast forward to that evening and we completely agreed with him! 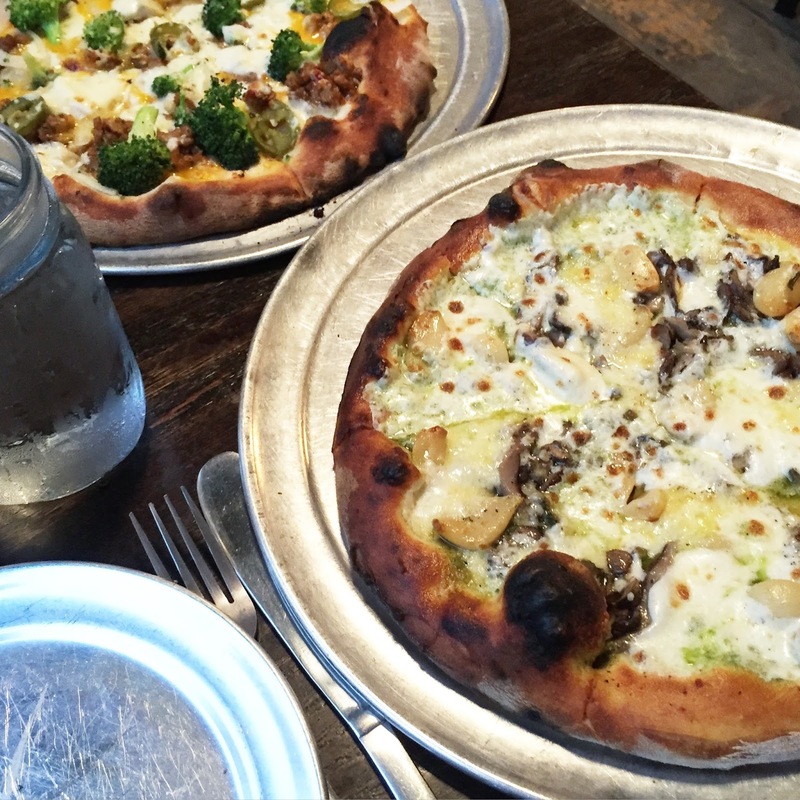 Even Stan, who is notoriously hard to please with food - he is used to NYC options his whole life so he is picky, stated that this mushroom, havarti and roasted garlic pizza broke his top 5 favorite pies. 3. Callie's Hot Biscuits - This place was recommended to us over and over again, so we had to stop there late one morning on our way out to Sullivan's Island. 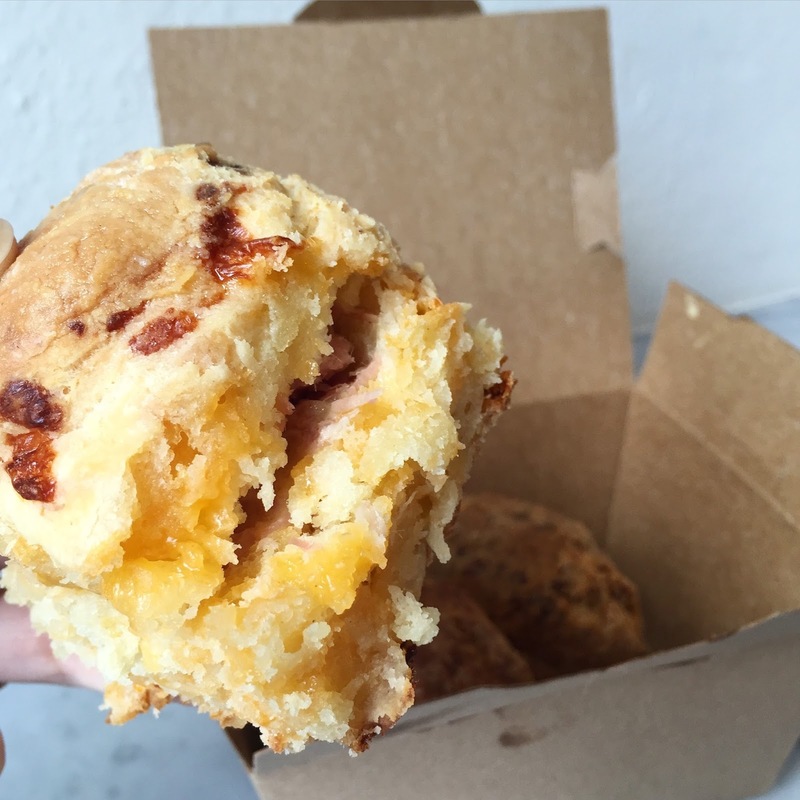 This is the ham and cheddar biscuit which was decadent and rich, but tasty. The biscuits are all homemade - and there are both savory and sweet options to satisfy everyone. 4. Xiao Bao Biscuit - Go on Charleston! This place seemed like what we would find in the east village of NYC, but were pleasantly surprised by how authentic and tasty these dishes were. 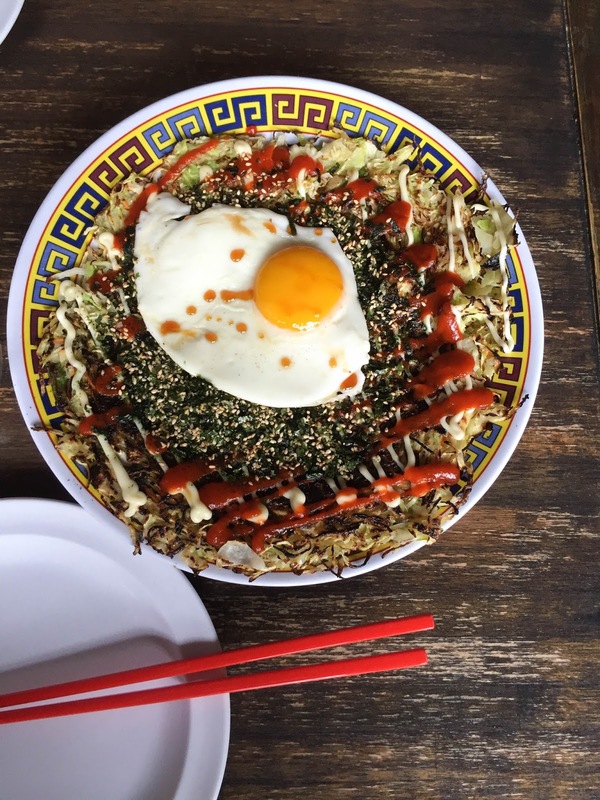 They are a mix of Chinese, Japanese, Korean and Thai and blend a variety of incredible flavors to create unique dishes. Since Stan is Chinese and grew up eating authentic asian cuisine of all kinds, his standards are often way too high to meet. But thankfully he loved this place and felt it was the real deal. 5. The Gnome Cafe - We grabbed a quick bite at this healthy cafe on our first day sightseeing and I loved all the fresh options. 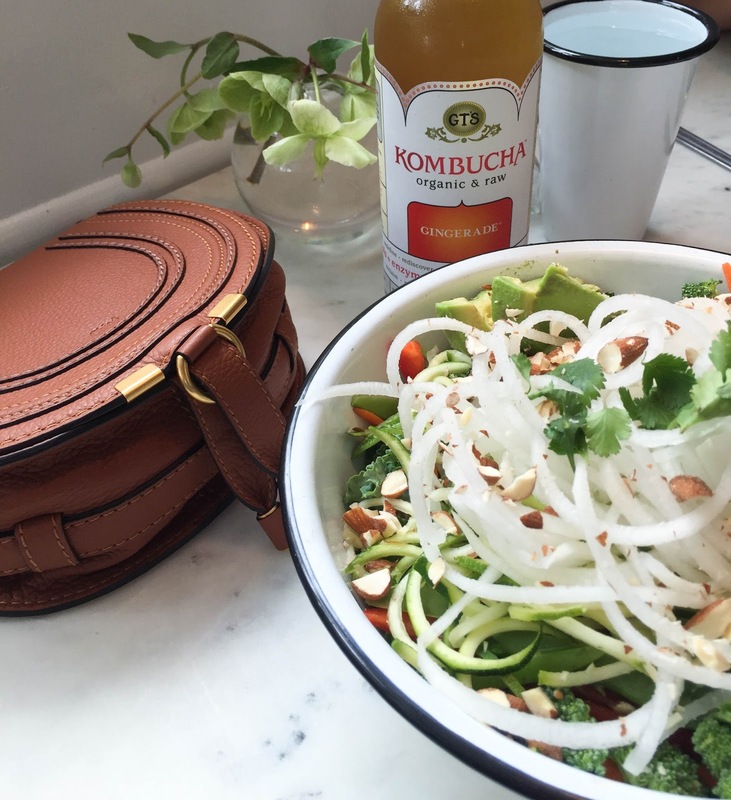 I had a kale salad with zucchini and jicama noodles and a bunch of other delicious ingredients such as pecans, avocado, etc and it was a welcome change from all the decadence I had been consuming for a majority of our trip. Vegans, vegetarians and health nuts - this is a great stop in Charleston. 6. The Westendorff - I didn't get a snap of our meal at this restaurant, but this was as fancy as we got for our time in Charleston. 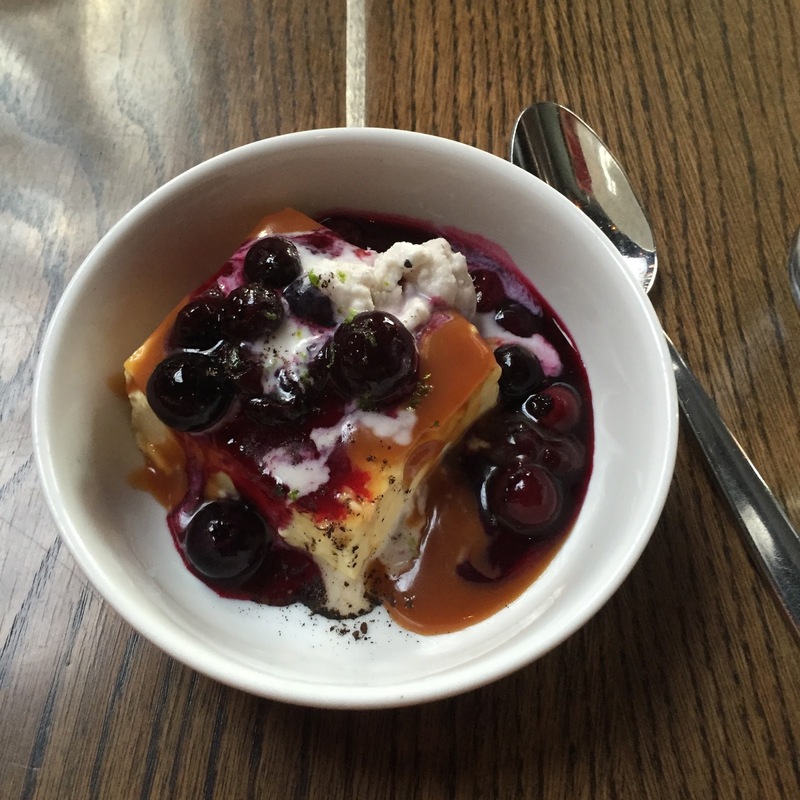 We wanted to stop by Fig and Husk, but didn't get reservations in time, though the Westendorff did not disappoint. I had mussels and Stan had a fish and chips dish that he raved about. The vibe is a nice mix of upscale and casual, with seating at a diner like counter next to regular tables and booths. We found that traffic was a major hassle. Other cities were crowded, but going anywhere in downtown Charleston was an ordeal. Give yourself some extra time to get around. With traffic being such a hassle, I saw a few public transportation options such as trolley cars/buses but it seemed not as widely used as in other cities. If you have an option to rent bikes, that would be a great solution. Bring quarters - we were consistently running out of them each time we needed to park. Most parking is metered, though there are a few public lots. 1. 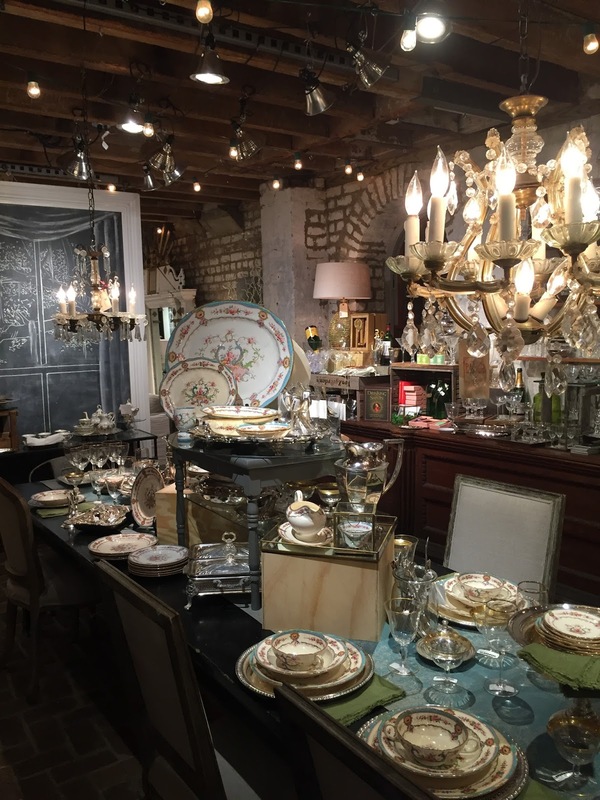 The Paris Market - If shopping for knick knacks, home goods, unique finds is your thing, get yourself to The Paris Market ASAP! It was absolutely amazing and we ended up wandering around there for almost an hour. As you can see from the above snap, there is so much to see and because the environment is so chic and adorable, you want to see it all! I picked up a few candles make locally in Savannah, but I could have gone home with a car full of things to be honest. This is a huge tourist destination but completely worth it. 2. 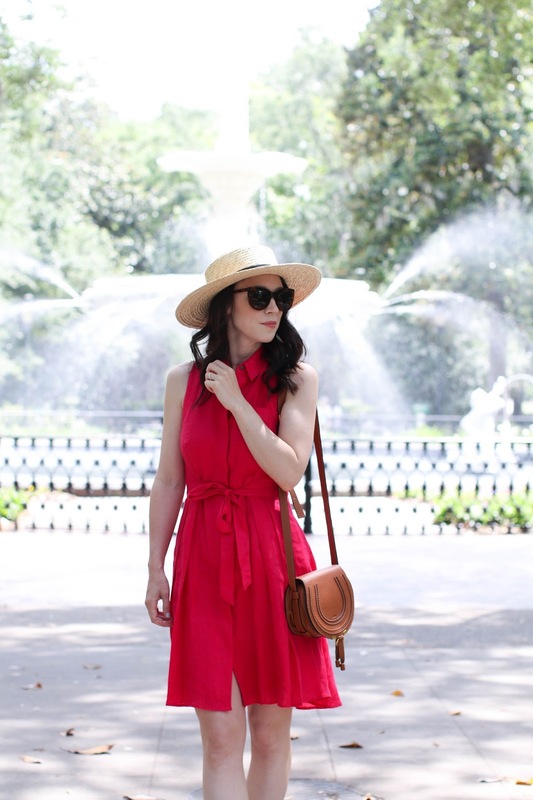 Forsyth Park - This is a major park located centrally in Savannah, and is beautiful to stroll around and enjoy. There are tons of large trees with the hanging Spanish moss that is so famous down south and a fountain towards the center of the park that is beautiful. Definitely pass by the park and walk through on your way to the historic squares. 3. The Historic Squares - Every block or so throughout the city, there are these squares with a park and homes/historic places surrounding. You can walk through all of them and it's quite a sight seeing all the grand homes lining the squares. Two places of interest to note: 1. 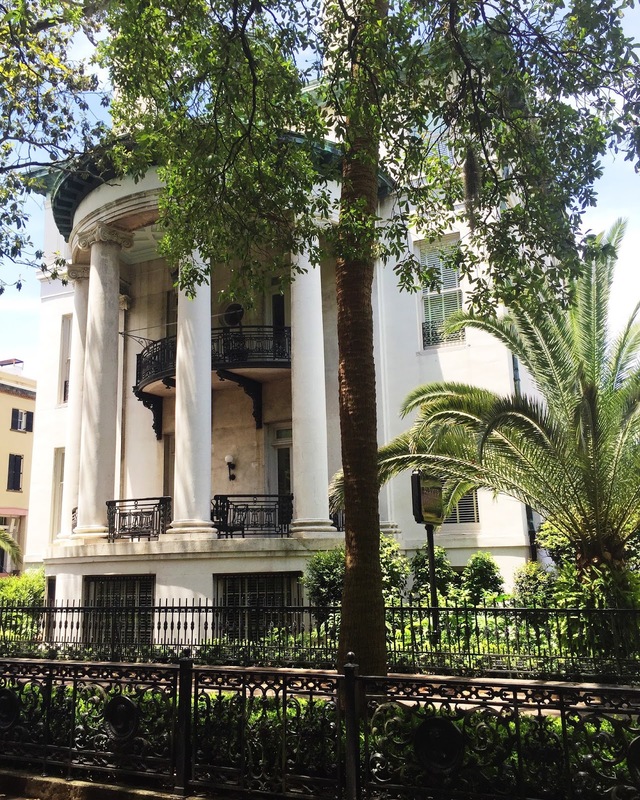 Mercer Williams House which is the setting of the book/movie Midnight in the Garden of Good and Evil, 2. 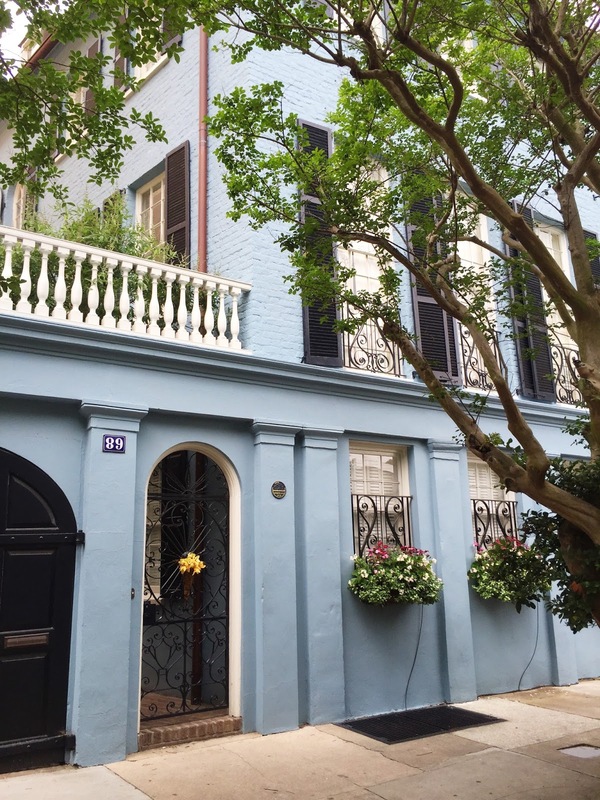 Jones Street which is a historic street of stunning older homes that have been renovated, but have that quintessentials southern charm. 4. 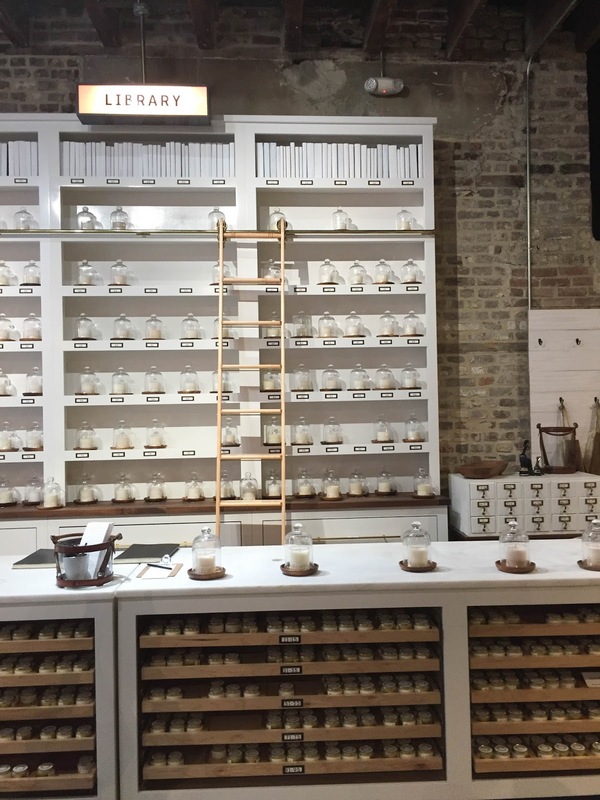 The Savannah Bee Company - I read somewhere online about doing a honey tasting, so I looked up where we could do that and went on the day it was raining. I thought it would be more like a wine tasting, though it was a bit more casual than that. However, it was amazing to taste all the different kinds of honeys they offered. There is a cute tasting bar and you can try each flavor - from traditional honeys, to whipped and a full honeycomb. We picked up a jar of our favorite to bring home with us. 1. The Grey - Savannah is not Charleston when it comes to food, though they are often in competition with one another. However, The Grey is a newer restaurant opened a year ago by the chef from Prune in NYC. I am a huge fan of Prune, which is a culinary experience to say the least, so we knew this restaurant had to be on our list to visit. If you are lucky enough to time it (and we were - yay! ), they do a sunday supper on the third sunday of every month for $40/person. There were about 4-5 courses and everything was delicious. The location of the restaurant is in an old bus terminal, so in addition to the food, the location and decor is something to enjoy as well. If you go to one restaurant in Savannah, make it this one. 2. The Wyld - I read an article in Eater that said there were three restaurants to visit in Savannah - The Grey, The Florence and The Wyld. We ate at The Grey, but sadly The Florence was closed when we were there but we still made it to The Wyld. Located right on the water, the view and ambiance of this place is like no other. It is magnificent. We went there after a HUGE storm, and it felt like something out of movie. As far as the food, it is seafood, seafood, seafood and super fresh. 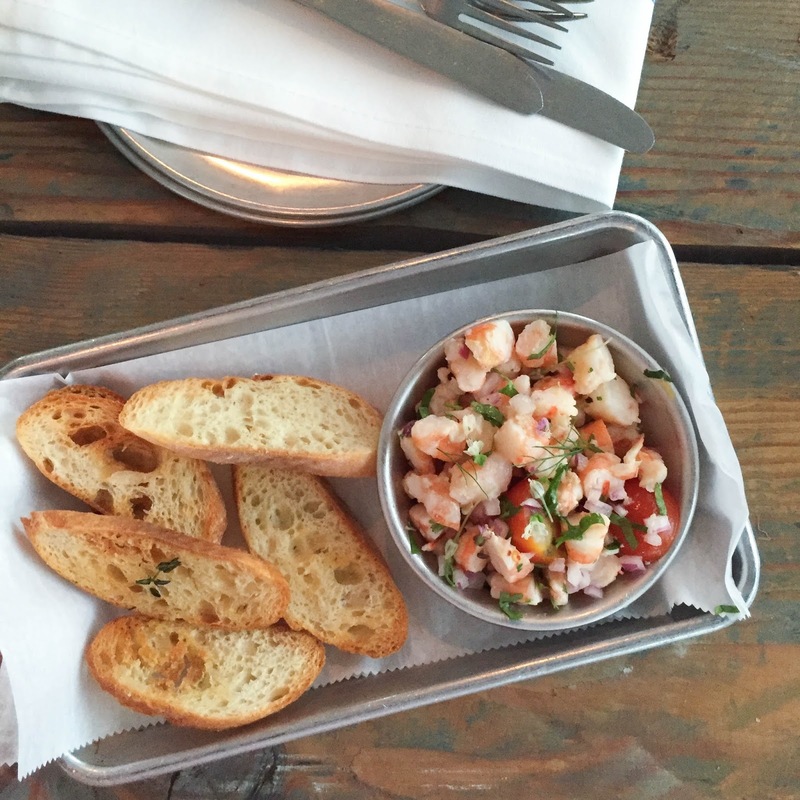 Above is a shrimp ceviche that felt like it just came out of the water onto my plate (in the best possible way). If you don't love seafood, go here for a drink or dessert. The location is a destination alone. 3. 22 Square at the Andaz - I know, I know, a hotel restaurant? I wasn't too jazzed either, but I had read great reviews and surprisingly it was delicious. 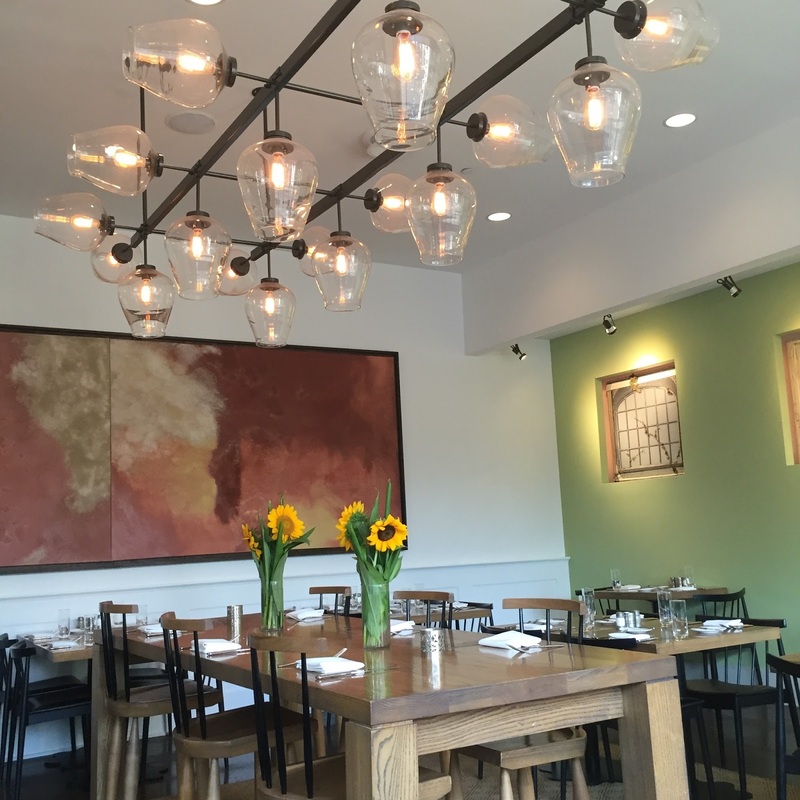 Fresh, farm-to-table dishes in a cute and minimalist setting. Get the pea hummus - it was my favorite item we had. 4. Leopold's - Every city has that dessert place that has become an institution because it's been around for so long. That is Leopold's for Savannah. 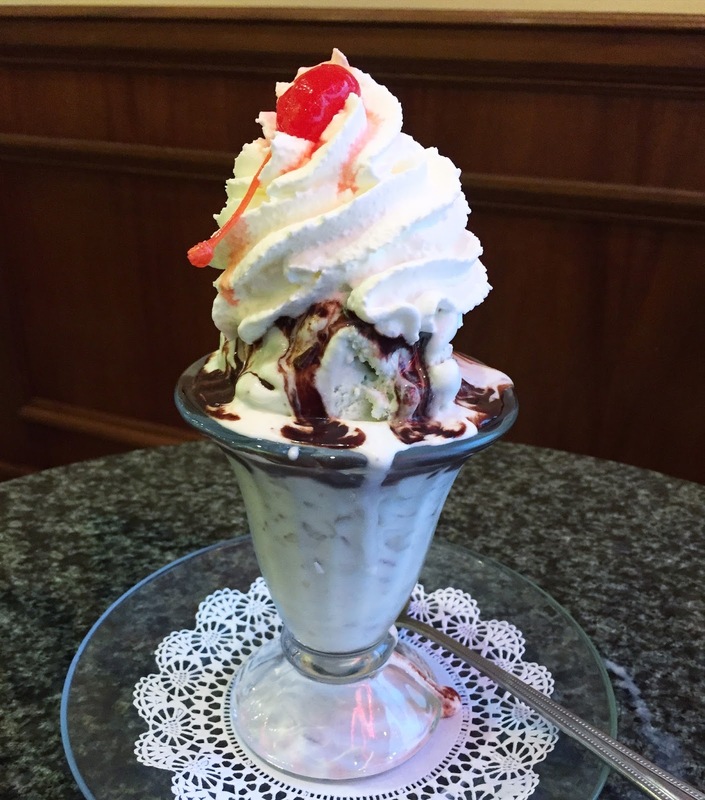 It is an old school ice cream parlor with classic flavors and menu options. I went for the standard hot fudge sundae which was delicious. Was it the best ice cream of our trip? Not in the least, but it is worth a trip if you are in town. Because we experienced it firsthand, I felt it was worth mentioning - this city floods! We had a very severe rainstorm and cars were getting stuck left and right. It was actually quite scary. It rained all day long with no break, and it trapped us indoors for most of the day. Bring rain boots and an umbrella with you in case the weather takes a turn for the worse.